While most Americans know that black soldiers served proudly in all of the country’s modern wars, it may come as a surprise to some that thousands of black servicemen fought in the Civil War. This year, as part of black history month, several hundred Dallas ISD elementary school students received firsthand history lessons about the role of these troops, nicknamed the Buffalo Soldiers. 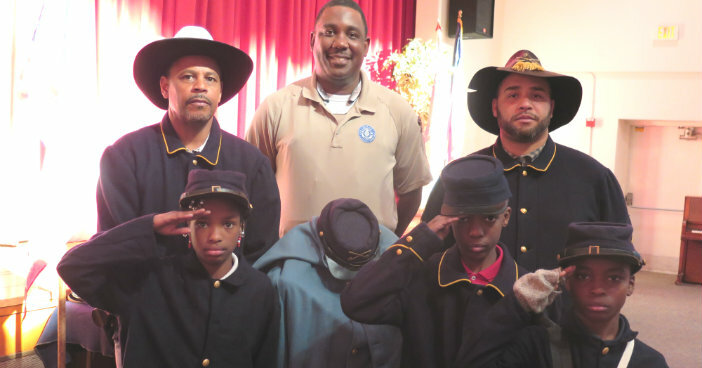 The Texas Parks and Wildlife Department sponsors reenactments of the stories of the Buffalo Soldiers. 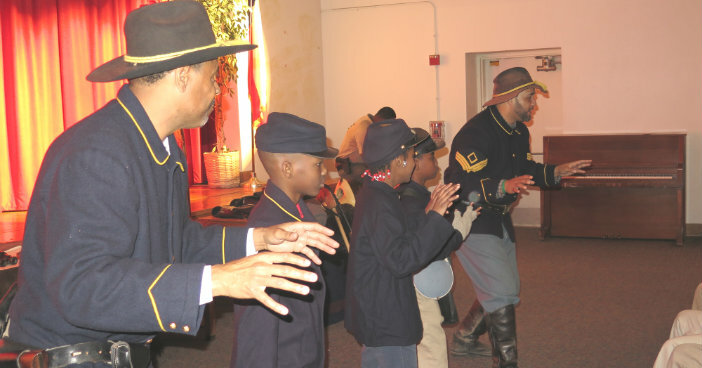 Volunteers in full regalia recently visited several African American Success Initiative schools to share the history of these soldiers with students. At Mark Twain Elementary, the volunteers outfitted several students with jackets and caps and made them part of the demonstration. The volunteers explained to students that Native Americans named the black cavalrymen Buffalo Soldiers because of their fierce valor in battle and their thick dark hair that billowed out in a cloud as the soldiers rode horses across the plains. In 1866, Congress adopted legislation creating the six all African American army units that became known as the Buffalo Soldiers. The main job of these horsemen was to protect settlers as they moved west and to build the infrastructure needed for the new settlements to survive. The Twain students asked all kinds of questions about the soldiers and tried out various artifacts representing items the soldiers would have used in the 1800s. Schools that are interested in arranging a similar visit to their campus can contact the program supervisor of the Buffalo Soldiers Program Luis Padilla at (512) 389-8569, or Luis.Padilla@tpwd.texas.gov.